"Gloomth"- Noun. Originally coined by Horace Walpole to describe the eerie Gothic ambiance of his Strawberry Hill home. The term was also used to refer to the especially morbid Victorians who treated preparing for death as an elaborate hobby. Established in 2007 Gloomth is a clothing and art label operated by Toronto artist Taeden Hall. Gloomth seeks to share it's strange universe through unique fashion, photography, illustration, and events. Blending Victorian mourning tradition, street fashion cults, wildflowers, and basement clubs to create our own signature style. We're a little bit of a lot of things. Gloomth is a love letter to the misfits of the misfits, to everyone who doesn't fit in- and doesn't want to. Get a glimpse into the “Uncannily Pleasant” style and work of Gloomth designer Taeden Hall in this fun video by Zoomin Tv! Available worldwide on Amazon now! 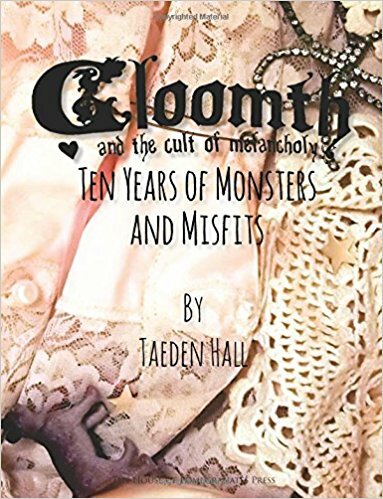 Explore Gloomth's last 10 years with original artwork by Taeden and many of our Gloomth Girl models, behind the scenes photos, fan-artwork, letters, stories, and more in our "Ten Years of Monsters and Misfits" book! Available on Amazon now!